Crewton Ramone's Blog of Math: 3rd Power Algebra? It's Just Complex Counting. 3rd Power Algebra? It's Just Complex Counting. Here is an excerpt from a lesson where we played around with some third degree algebra made rectangles and counted the sides. You can see from the vid we are in the drawing stage, but we still get out manipulatives so we can get a solid handle on what we are doing which is counting. We start off with all positive expressions and basically factor them. 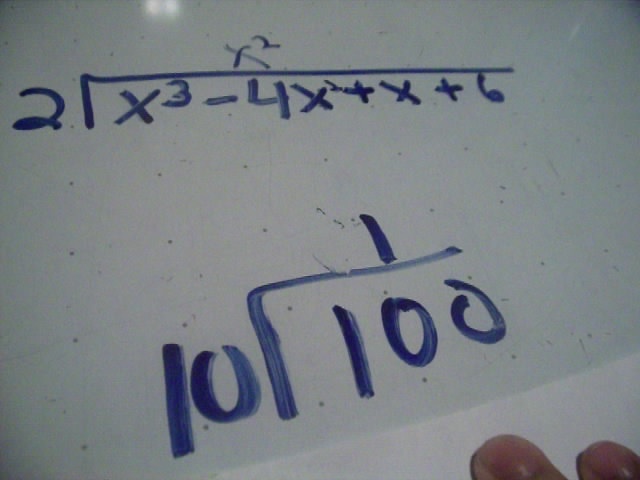 Then we move on to expressions with negative coefficients and do division too. When you are first starting out just doing one problem can take up 15 minutes or more...but then as the understanding increases it will go faster and faster. The way to increase understanding is not to do the same thing over and over again just using symbols and changing the problems, the way to get them to "get it" is to start in the concrete move to drawings and increase the degree of difficulty gradually as concepts are understood and mastered. This also shows how important neat writing is...lol...sloppy symbols can make the difference between an A and a B, or worse a C and an F. Also, for those with a password you will see on the follow up vids on the Advanced Algebra Page. Password costs all of 3 bucks or $12 for a year pass. Buck a month is hard to beat. You will note sometimes I say one thing and mean another in these vids when I read the problems and say "x-squared" instead of "x to the third" and so on. I watched one vid where I did it over and over again...but eventually I say it right. Painful for me to watch. As usual I forget to turn the camera on until we've done a lot of them. Remember always start in the concrete, use three period lessons and make sure drawing is part of the lesson too, don't just use symbols. Here we see that base x also has place value and answer the question "why do they go where they go? "...you'll see this on the next video look for "P2 Crewton Ramone and Syd Play with the 3rd Powers" on the Advanced Algebra page. Scroll down to the part that covers 3rd and 4th power. My friends in Africa have shown that the passwords are valuable enough to steal, and enjoy putting jibberish in the email list box to let me know they have gotten into the password pages without paying. So far the ISP's trace back to Ghana and Nigeria. It's good to know they have enough value to some that they are worth stealing. Passwords will change soon so put your name in when you get in, that way you can be kept up to date on the new password and the new stuff that's being added so you can get the most out of your password while it works. Also Next year prices will go up a little again as more and more people find out about how cool this is. Those who have passwords or have bought passwords will get special discounts on renewals. If you buy kits or products from me or take tutoring you automatically get a password gratis. Be sure to find me on Facebook or follow along on Twitter. There's only one Crewton Ramone so searching out vids and pages should be pretty easy.